You know what they say – think before you ink! Maybe you’re planning on getting your first tattoo or you are thinking of getting another one because you got hooked. Either way, it’s good to discover popular tattoo designs that could inspire you. Some people prefer to have their own tattoo ideas done, while others go for something they’ve seen somewhere. 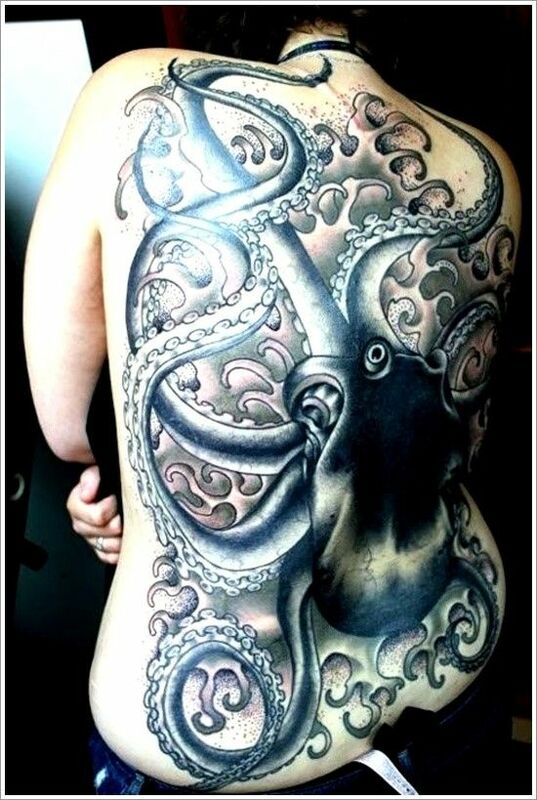 Among the tattoo themes that really bloomed in popularity in recent times is the octopus tattoo. The mystical creature of the seas is seen more often in both women and in men, in the shape of octopus tattoo designs. 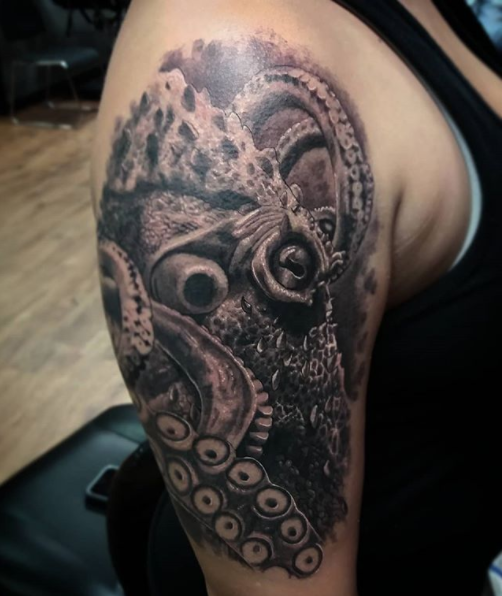 1 What is the History of Octopus Tattoos? 2 Does an Octopus Tattoo have a Meaning? 3 Girls vs. Boys: What Are Their Preferences? 4 Where Do They Usually Place Octopus Tattoos? 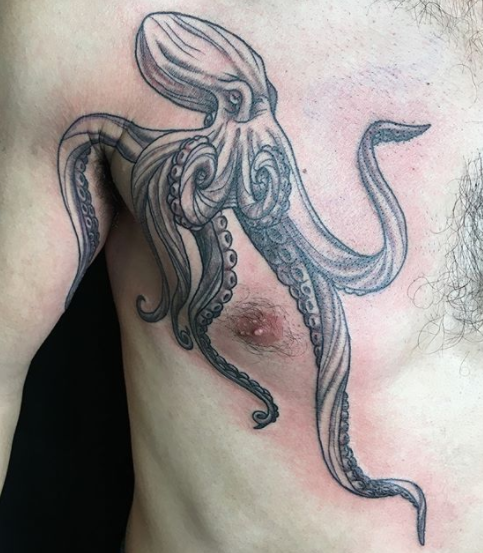 What is the History of Octopus Tattoos? Many cultures have an octopus-like monster as a part of their mythologies. Ever since the ancient societies of Greece and Egypt, there were always octopus creatures, usually presented as evil beings, and often associated with ships and other floating vessels. One of the oldest is Kraken. It is often depicted in tattoo designs but also in other graphic artworks. It was a giant octopus known for attacking ships. Another popular depiction of an octopus is the Cthulhu, which is the mythical creature created by the legendary writer H.P. Lovecraft. It is described as an anthropoid monster which has a gigantic octopus instead as his head. 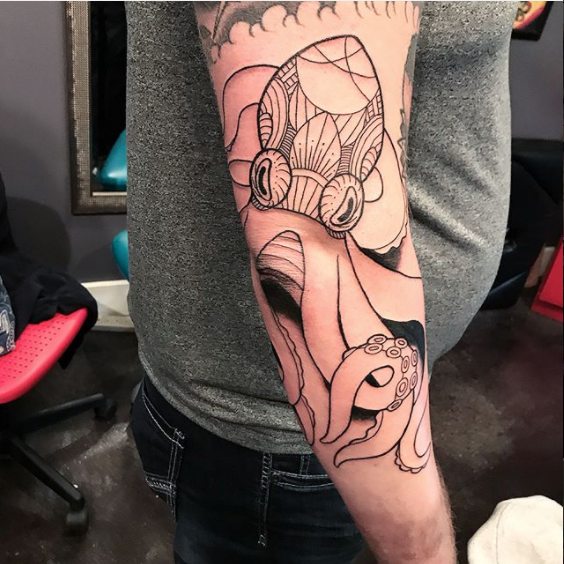 Does an Octopus Tattoo have a Meaning? Ultimately, each and every tattoo has a special and unique meaning to its owner. 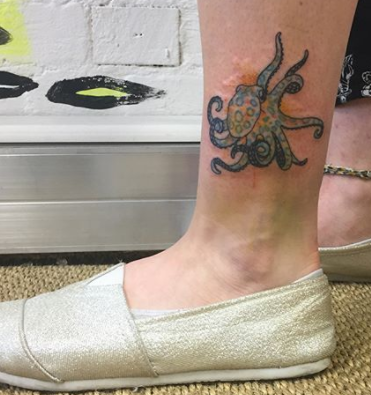 Octopus tattoos can stand for many different things. The Octopus is a spineless creature, which makes it easy for them to move fluidly. Therefore, they can be considered true escape artists. Some people may interpret them as a totem that reminds them to let go of old ways and be relaxed. Escape is often depicted in the form of an octopus tattoo. When attacked, an octopus will let go of a limb, just to get out of a dangerous situation. This is why it can symbolize someone or something that was good riddance. 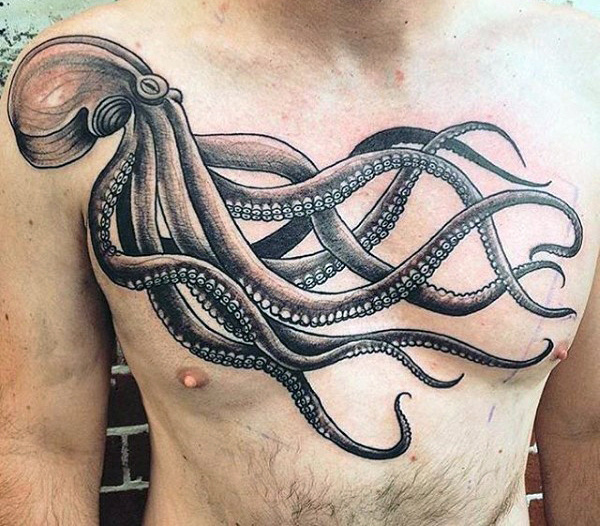 Quite often people get an octopus tattoo because the creature is basically a master of camouflage. This is usually the case with those who are attracted to mysticism. In ancient times, the octopus also stood as symbols of regeneration and intelligence. Those who like to dig deep through the pages of history books could well claim this as the main reason behind their octopus tattoos. The octopus actually has three hearts, which is why some people associate it with the idea of immortality. Also, when pictured with another object, it can often symbolize a dream which never came to be. Other common meanings behind an octopus tattoo may include adaptability, versatility, resourcefulness, and the defeat of one’s enemy. Quite often, a tattoo enthusiast may opt for an octopus tattoo simply because they like the look of it. Its complex anatomy can be presented in many fantastic ways. Girls vs. Boys: What Are Their Preferences? Usually, some tattoo designs are more popular with guys than with girls. This isn’t the case with octopus tattoos though. The octopus is equally popular among both genders. There are many different ways you can individualize your future octopus tattoo, no matter what your gender is. Girls often go for cartoon octopus designs which do not depict the creature as dark and menacing. If you choose vivid colors, you could really go for a cheerful octopus – if that’s your way. Guys usually go for darker and more complex designs. In most cases, these include some maritime objects, so the octopus gets accompanied by an anchor or an entire ship. 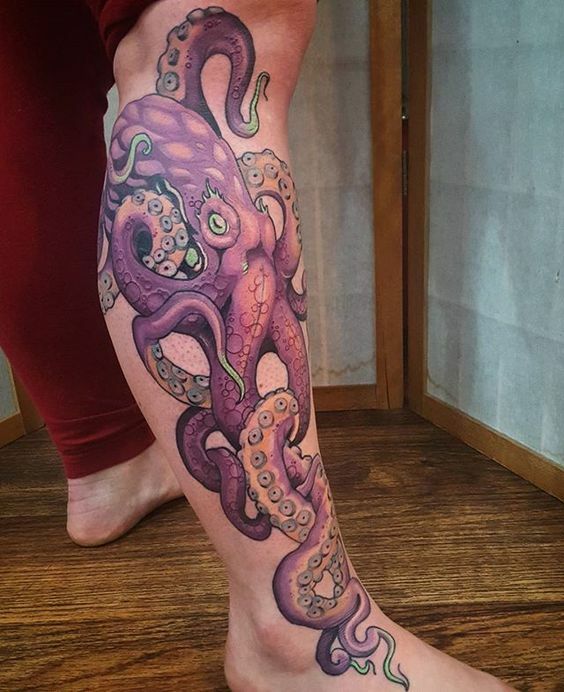 Such octopus tattoos usually call for a much more realistic approach in terms of style and technique. One of the most popular motifs is the traditional Japanese depiction of an octopus. Where Do They Usually Place Octopus Tattoos? 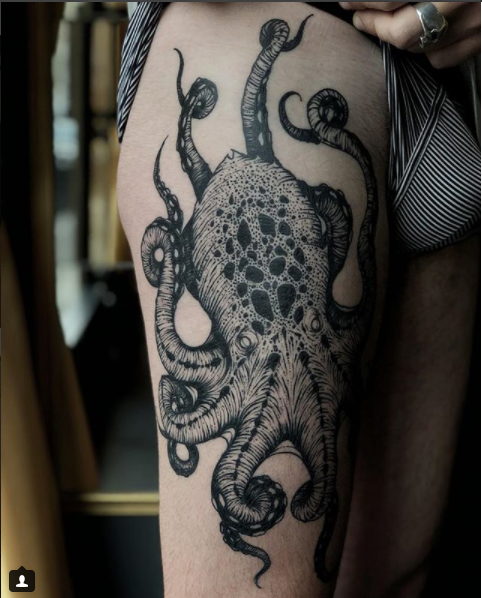 Some tattoos can be placed virtually anywhere on your body, but if you plan on having an octopus design tattooed, you should really think about it carefully. Due to its peculiar 2D anatomy and shape, it can create very dramatic effects on your body when placed right. The tentacles may extend so as to be wrapped around your arm or leg, and they can also be some sort of a bridge to another tattoo. Of course, the arms and the legs are the most obvious choices, because their cylindrical shape provides an area for dramatic wraparound effects. For this reason, girls often choose to get their tattoos done on their thigh. Placing your octopus on the shoulder and letting it drip down across your arms and your chest is another popular option. Other commonly covered areas include the stomach, groin, and even the neck area. The aforementioned Japanese-style octopus tattoos usually cover the entire back. 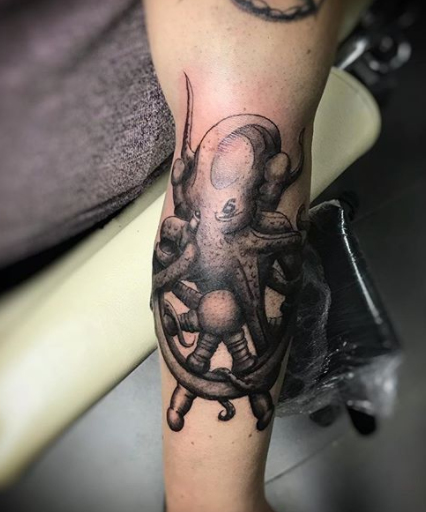 In case you’re still not sure what your future octopus tattoo should look like, we can always provide you with a fine selection of inspired tattoo designs to choose from. 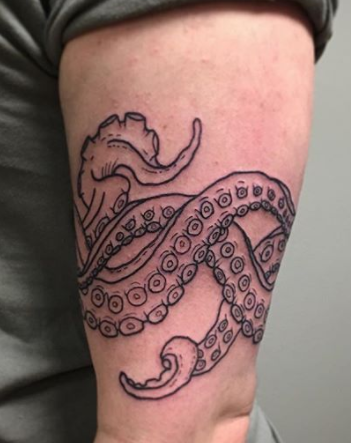 Even if that doesn’t cut it for you, we will be more than happy to bring your own design to life or come up with a few octopus tattoo ideas of our own. 3. 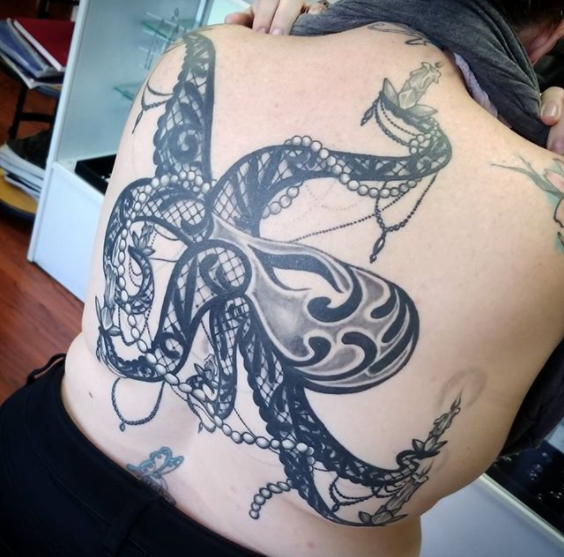 A large back tattoo of an octopus wrapped in jewelry. 4. An octopus tattoo inked on the shoulder blade. 5. 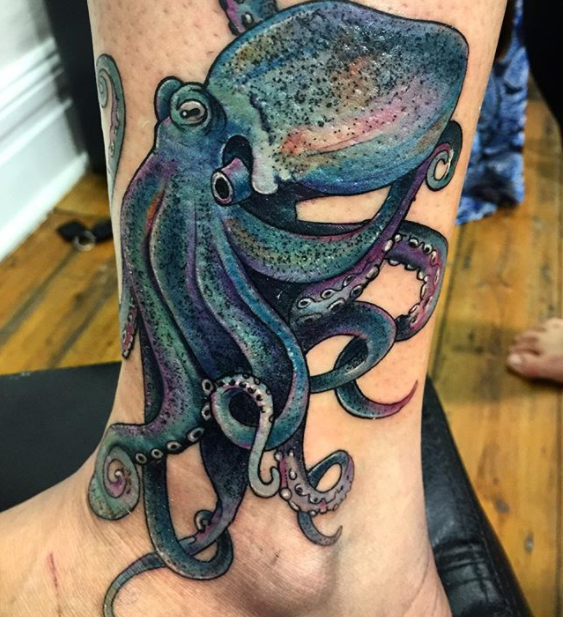 A tattoo of a blue octopus. 6. 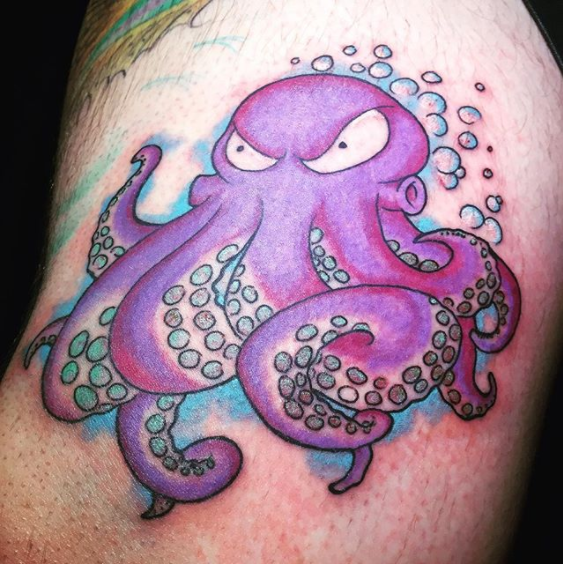 A colorful octopus tattoo with a cartoonish rendition. 7. A comical interpretation of an octopus tattoo. 8. 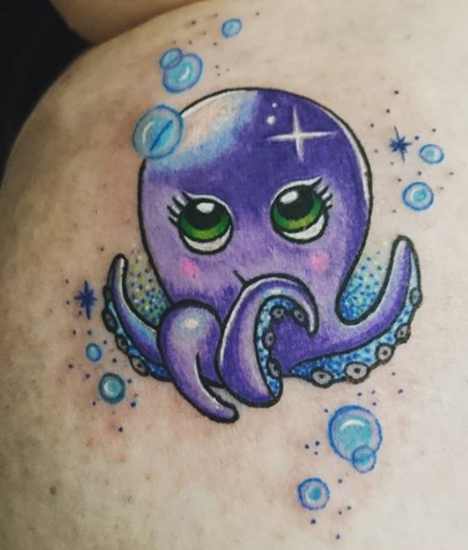 Another cartoon-styled octopus tattoo. 9. 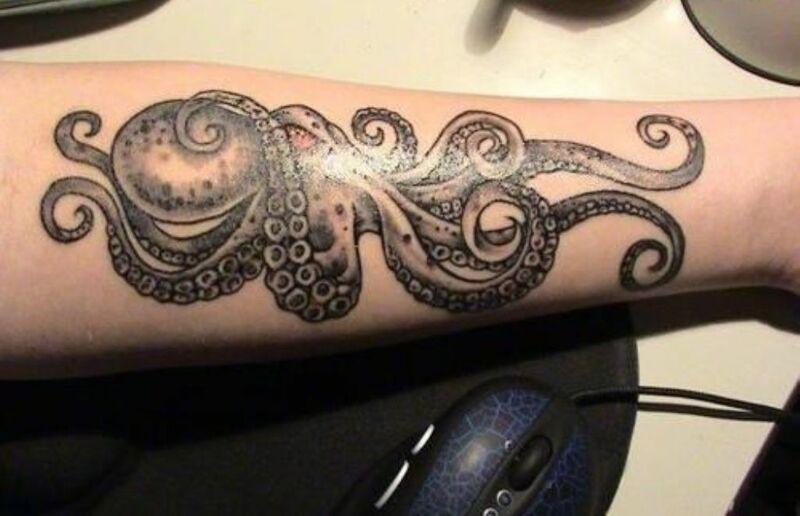 A Doodle-like tattoo of an octopus. 10. A fullback tattoo of an octopus. 11. 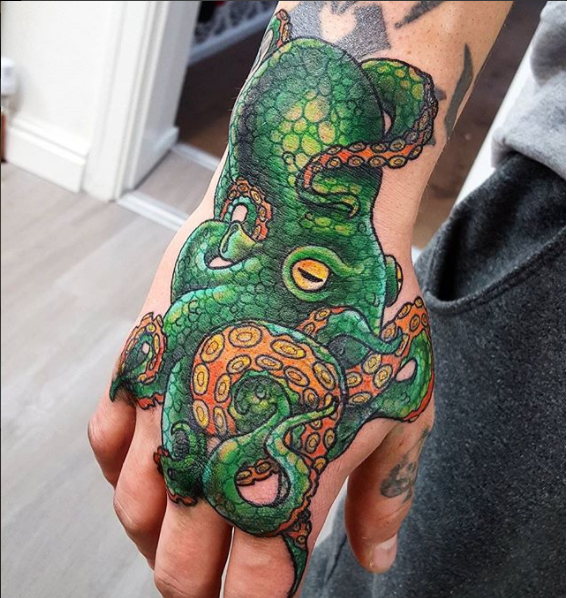 A green octopus tattoo placed on a knuckle. 12. A tattoo wherein an octopus wraps itself onto a helm of a ship. 13. 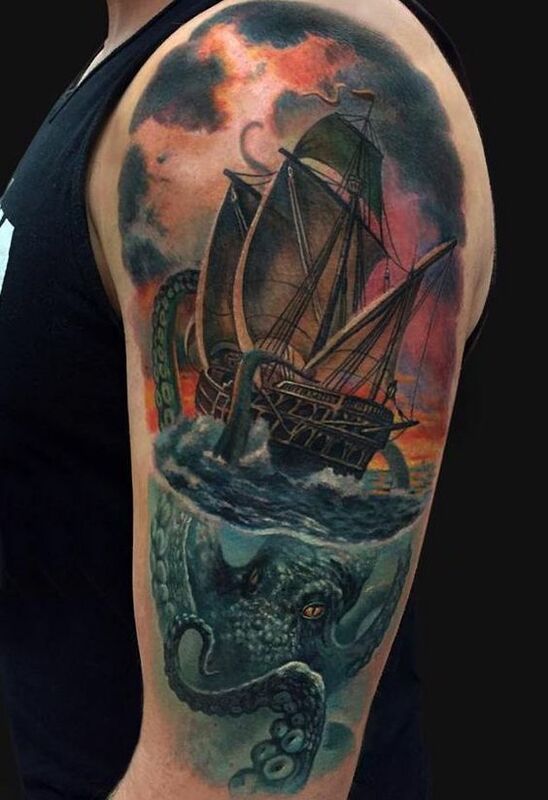 A tattoo of a Kraken (Octopus-like sea monster) consuming a ship. 14. 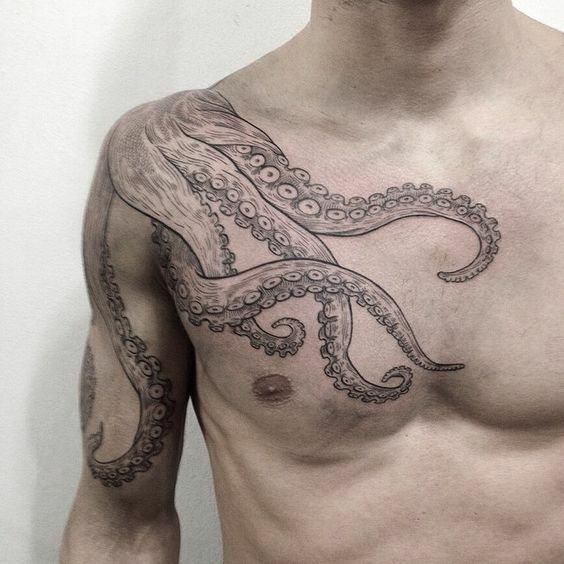 A Large Octopus Tattoo situated on the shoulder and chest area. 15. 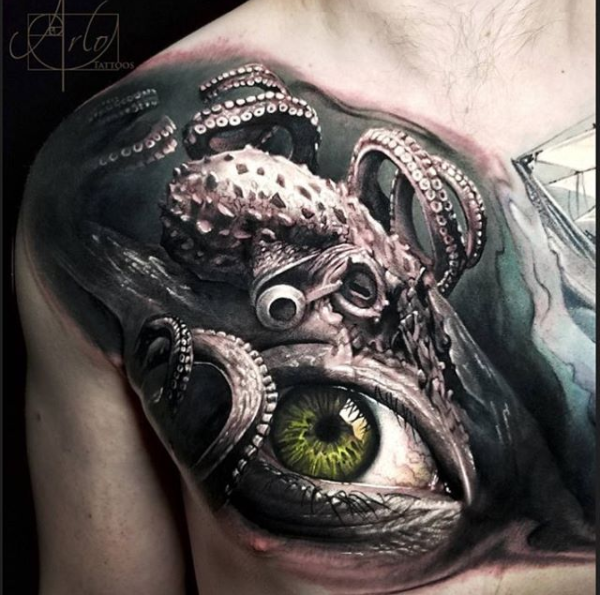 A stylized tattoo design of an octopus and a human eye. 16. 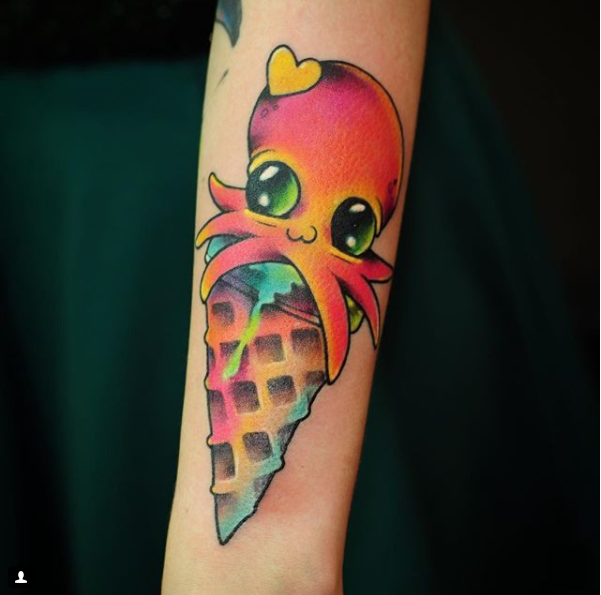 A cute octopus tattoo over an ice cream cone. 17. 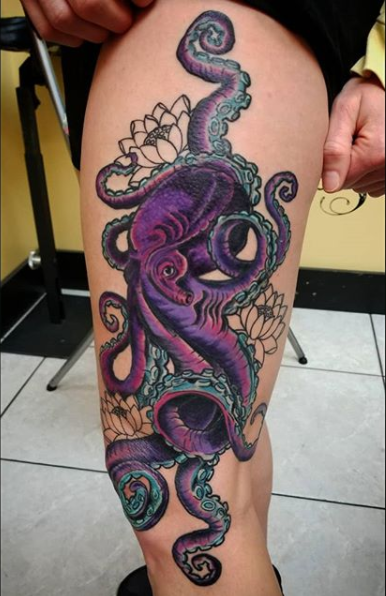 A purple octopus tattoo inked on the legs. 18. 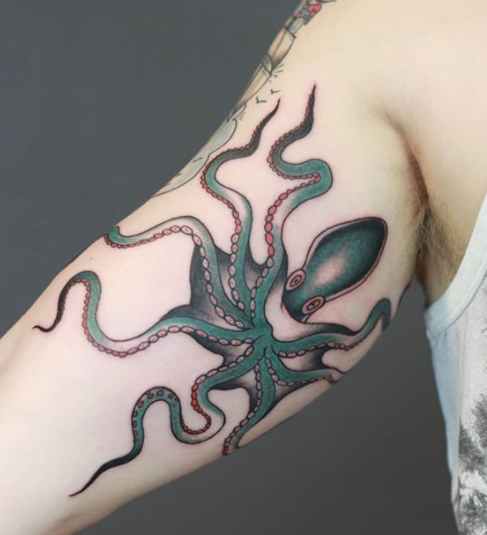 A realistic tattoo of an octopus. 19. 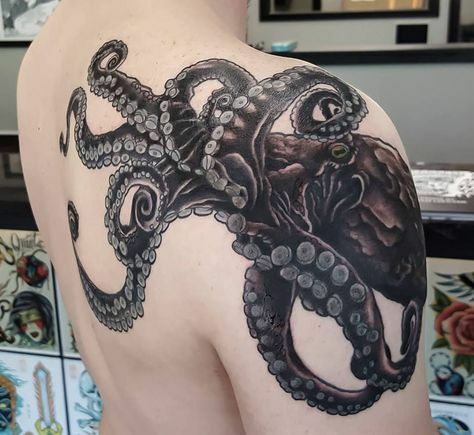 A shoulder tattoo of octopus tentacles. 20. 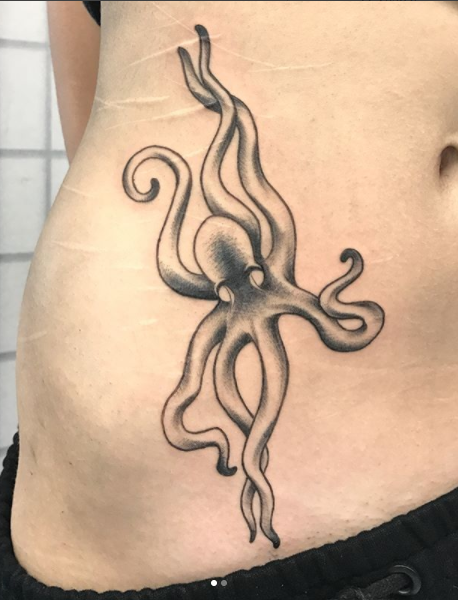 A simple octopus tattoo with shadow elements. 22. Another sketch-inspired octopus tattoo. 23. 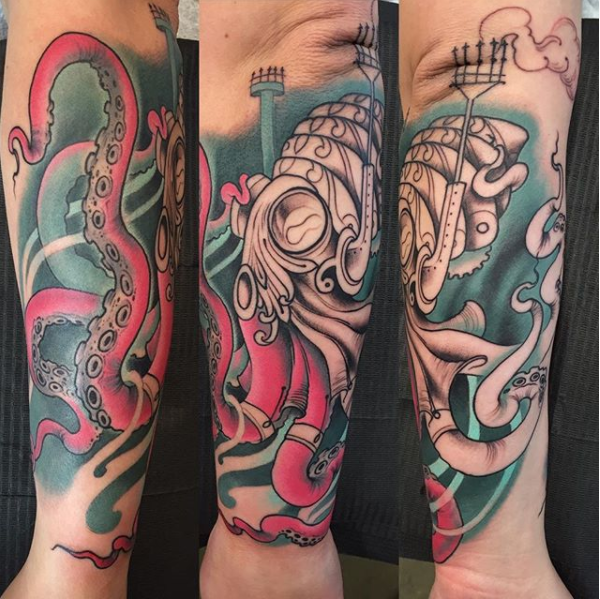 A tattoo of octopus tentacles wrapping around an arm. 24. Another cartoons-inspired octopus tattoo with flowers. 25. A shoulder octopus tattoo with tribal detailing. 26. 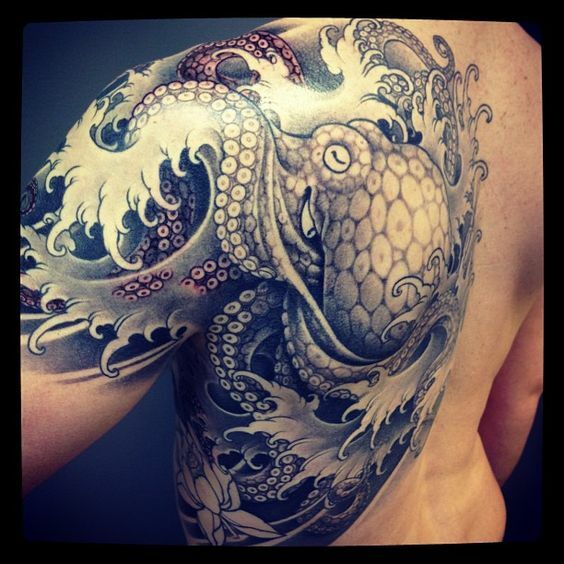 A Japanese-inspired octopus tattoo design with a tsunami waves detail. 27. 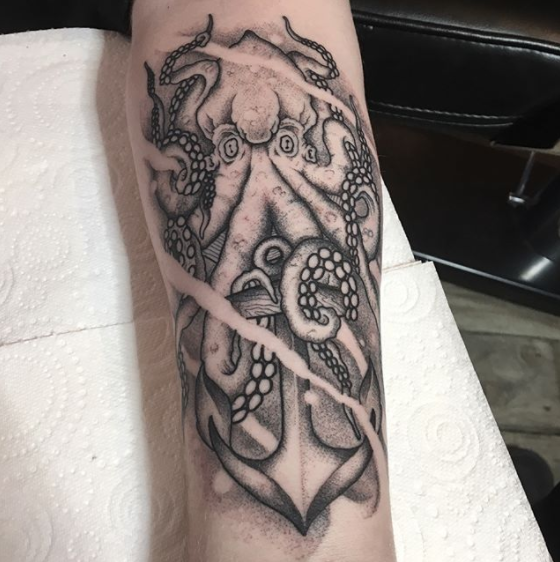 A small sleeve tattoo featuring the underside of an octopus. 28. 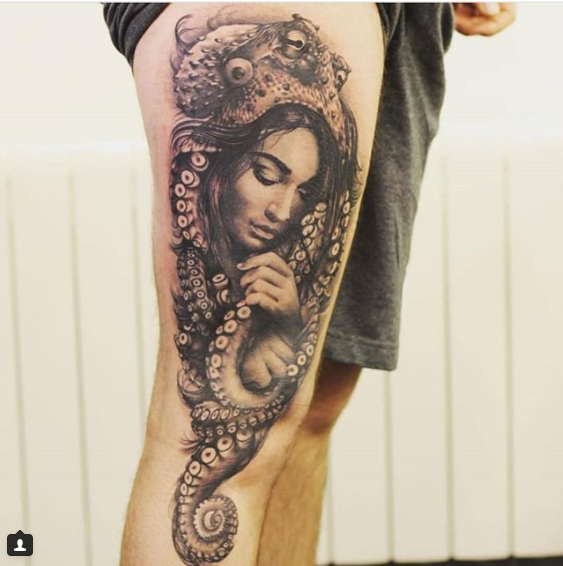 A tattoo wherein it features a woman being wrapped around by an octopus.